A fitting finale to the Wyrd Museum trilogy. So, I almost gave this book 3 stars, but the last 100 pages redeemed it (not that 3 stars is bad). I still think I like the previous two books better, but I did enjoy this one. It just seemed a bit more disjointed maybe, or like Jarvis was trying to fit too many things into one book. Brilliant end to the trilogy! While I stand by my previous statement that Robin Jarvis always makes the second book in each series the best one, I still really enjoyed this story.In this book, the action is firmly back in the Wyrd museum, as Woden and his agent cause various different timelines to converge, resulting in numerous characters from the building’s history reappearing - some good, some very very bad. As with most Jarvis books, this story had some really scary moments, and younger readers in particular might find the ending quite frightening, particularly the fate of Neil’s father. The story is balanced out with some joy though, and some really sad moments.Overall this whole series is definitely worth a read, and although the first book is a bit of a slog, the payoff is worthwhile. In a grimy alley in the East End of London stands the Wyrd Museum, cared for by the strange Webster sisters – and scene of even stranger events.But something has come to disturb the slumbering shados and watchful walls of that forbidding edifice. Miss Ursula Webster is determined to defend her realm to the last as the spectral unrest mounts. Once again, Neil Chapman is ensnared in the Web of Fate, facing an uncertain Destiny. Can he and Edie avert the approaching darkness, or has the final Doom descended upon the world at last?The thrilling conclusion to the chilling trilogy Tales from the Wyrd Museum.Surprisingly much better than the first two books. 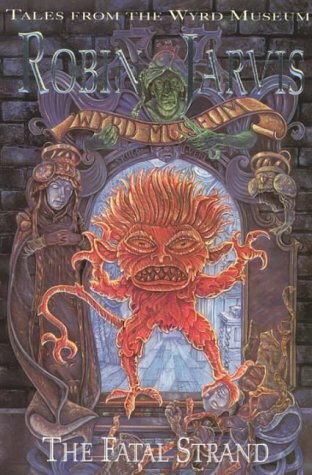 There's a real tension and unpredictability and for a change the premise isn't ridiculous and takes place inside the museum, whereas the other two books were set mostly away from the building even though the series is called Tales from the Wyrd Museum. The Webster sisters and Edie are also less irritating and more interesting and the history of the museum and the sisters are coherently explained.Jarvis' obligatory person in disguise is once again present and correct but the depiction of the various eras of the museum is well done and the statues that take on Jack Timms are a strange group for whom you root to win. The ending is also satisfying. If only Jarvis had starting writing like this earlier. Wow - what an amazing ending to this trilogy.The battle between the Gallows God and the three Fates is coming to an end. Neil and Edie must help Ursula gather as much power as they can to protect the Loom of the Destiny, even if that means waking up the Wyrd Museum and the secrets it holds. But the other side has that idea too and there's not much they can do when the very building they live in turns against them. But right at the end, they release a huge mistake has been made and an even more ancient enemy is out to get revenge.I honestly can't say enough good things about this book and its preceding volumes. At no time did I have to say - 'well, it was written for children'. They are extremely well written, the characters are great and the plot zooms along with plenty of thrills, scares and edge of the seat moments. Some of the adult fantasy series could do with emulating it - there are no complicated secondary plots, no awkward love interests that only interrupt the action and a satisfying ending that makes you feel good about what you've just read. It does have the deaths of main characters, the baddies get their just desserts and the goodies, you hope, all live happily ever after.Highly recommended - am tempted to read this series again some time. This was a wonderful and very fitting end to the series. In this book the stakes are raised with the battle between good and evil being centered in the museum, and revelations abound. For me this book tied in the characters from the first two novels well and made an exciting twist or two along the way. Robin Jarvis is one of the best children's writers I know, and he manages to convey darkness in such an accessible way. This is a fitting ending to his Wyrd Museum trilogy, and its creepiness will stay with you for a long time after you finish reading it. Took me a while to get through, but once I got over how annoying I found Neil and Edie, it was a pretty good end to the trilogy.Also, I only added horror as this book was pretty dark and gruesome. A well fitting ending to the series. I wish there would be more to it, but fine stories has to come to an end. The plot move a long nicely and this being a kids book? I think some older readers may enjoy this. There should be no shame of adults reading kids books. This book made me cry so many times...the last time because such an amazing trilogy had come to an end. I will forget this journey and the inspiring characters! This was an excellent completetion to the series - lots of action - kept moving rapidly, interesting - well written. It was so good! Really sad to see this interesting series end :( but it was a good end. Excited to find more books with Norse mythology in them. I found this trilogy started off well, but got progressively more violent. Had problems finishing it. A disappointing conclusion to the Wyrd Museum trilogy. Robin Jarvis - Robin Jarvis (born May 8, 1963) is a British children's novelist, who writes fantasy novels, often about anthropomorphic rodents and small mammals – especially mice – and Tudor times. A lot of his works are based in London, in and around Deptford and Greenwich where he used to live, or in Whitby.His first novel – The Dark Portal, featuring the popular Deptford Mice – was the runner up for the Smarties book prize in 1989.